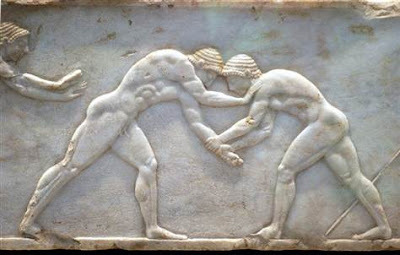 The Ancient Olympic Games were a series of competitions held between representatives of several city-states and kingdoms in Ancient Greece. These games featured mainly athletics, but also combat and chariot racing events. 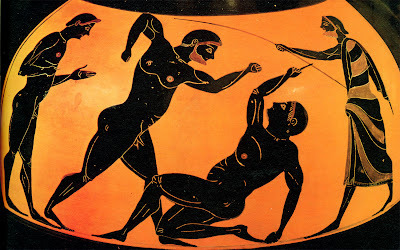 The Olympics were of fundamental religious importance, featuring sporting events alongside ritual sacrifices honouring both Zeus - whose famous statue by Phidias stood in his temple at Olympia and Pelops, divine hero and mythical king of Olympia. At the first one-day Olympic Games, the only event was a short sprint from one end of the stadium to the other. Gradually more events were added to make four days of competitions. They included wrestling, boxing, long jump, throwing the javelin and discus, and chariot racing. In the pentathlon, there were five events: running, wrestling, javelin, discus and long jump. One of the toughest events was the race for hoplites, men wearing armour and carrying shields. Only male citizens were eligible to compete in the Olympic Games. The term 'citizen' refers to a man who participated in local politics, voted and provided military service. Citizens were of Greek descent and had jobs or trades, slaves were not allowed to compete. Some of the most skilled competitors had humble job titles: The first Olympi­c champion was Koroibos, a cook who won the stadion race in 776 B.C. Winners were given a wreath of leaves, and a hero's welcome back home. Better still, winners get an improved chance to marry rich women, enjoy free meals, receive invitations to parties, and have access to the best seats in the theatre. The running track was much wider than a modern one. Twenty people could run at once. Probably the pankration or all-in wrestling was the nastiest event of the games as there were hardly any rules. Biting and poking people's eyes were officially banned, but some competitors did both! While it does not seem very sporting to us, all-in wrestling was very popular. Boxing was tough too. The fighters wore leather gloves and a boxer was allowed to go on hitting his opponent even after he'd knocked him to the ground! However, cheating was punished. Anyone caught cheating, trying to bribe an athlete for instance, had to pay for a bronze statue of Zeus as a punishment. The Olympic Games reached their peak in the 6th and 5th centuries BC, but then gradually declined in importance as the Romans gained power and influence in Greece. FROM WHAT PLANT DID THE LOTUS EATERS EAT THE FRUIT AND FLOWERS?